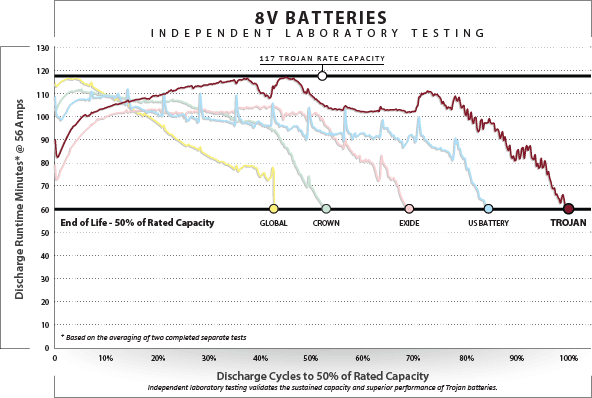 According to independent testing…Trojan has succeeded in our pursuit of battery performance excellence. Competition…we like competition…it brings out the best in us. At Trojan Battery we know that building the highest performance batteries doesn’t just happen by chance. It requires knowing the needs of your customers. It requires knowing our competitors and the products they build. And it requires sheer determination and an unwavering commitment to quality. That is why for over 90 years the heart and soul of Trojan Battery has been dedicated to advanced technology, pioneering innovation, comprehensive testing and manufacturing excellence.